Hope you’re all off to great start of the week! As we’re still in transition phase to colder months, the weather is still tolerable where I can survive with short skirt, so I like to utilize it as much as I possibly can. Restyled this beloved zip detail one I bought last season (also seen HERE) with a black turtle neck blouse. The classic style with black and camel color palette is always a foolproof outfit formula of all time. As always, thanks so much for reading and see you for Thursday post. 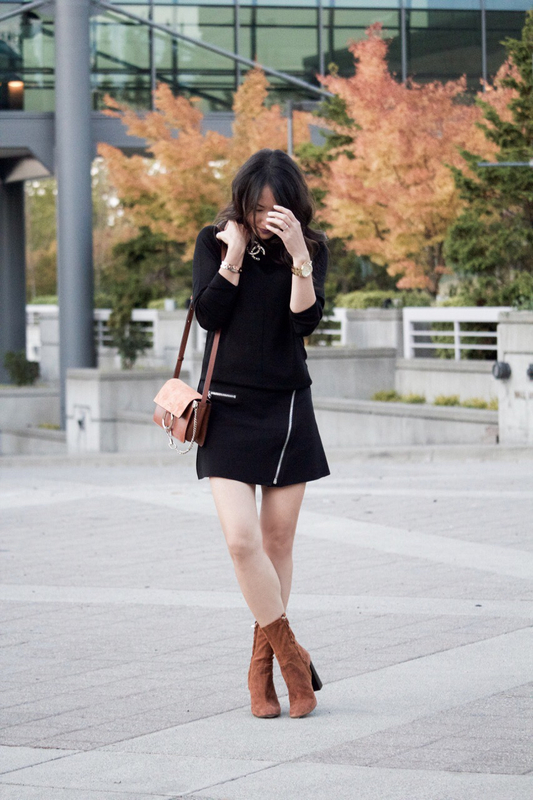 I always love a black and camel combo – and those booties are beautiful! You look great! I absolutely love black and camel paired together, especially for fall! You look gorgeous, girlie, those boots are so fab! Thanks so much for sharing and I hope you’re having a great start to your week so far! Awww…Thanks so much lovely for stopping by. Wishing you a wonderful day. Thanks Eva, you have amazing style as well. I enjoy your blog. Thanks for sharing.